"Bourbon transcends ingredients and brand names. It embodies a culture, a feeling, and a sense of unity that draws friends together and brings foes to peace." Are you a bourbon fan? Bourbon is a type of whiskey and it's a specifically American spirit. In 1964, Congress passed a resolution, stating bourbon was a "distinctive product of the U.S." granting the term legal protection. Other countries can make their own corn-based whiskey, but they may not label it as bourbon. It also is a popular sand lucrative spirit, with Kentucky-made bourbon actually consisting of about 35% of the value of all distilled spirits produced in the U.S. In addition, it is the largest category of exported U.S. distilled spirits, accounting for 29% of such exports. Most importantly, Bourbon is delicious, a diverse and versatile spirit. Drink it on its own, in a cocktail or use it while cooking. 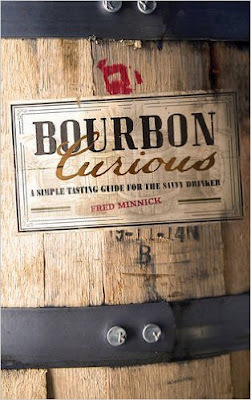 Learning more about this intriguing whiskey can be helpful and you might want to check out a compelling new book, Bourbon Curious: A Simple Tasting Guide for the Savvy Drinker by Fred Minnick (Zenith Press, August 2015). The book is available as a 240-page hardcover ($22.99) or an e-book (currently $2.99 during the month of November). Fred is a whiskey writer who lives in Kentucky and has penned three prior books, including Whiskey Women: The Untold Story of How Women Saved Bourbon, Scotch & Irish Whiskey. His whiskey articles have been published in a variety of magazines, including Scientific American, Whisky Advocate and Whisky Magazine. In addition, he is the "Bourbon Authority" for the Kentucky Derby Museum and participates as a judge in numerous spirits competitions. Fred is also a personal friend and he certainly knows his bourbon. The basic idea behind this book is to dispel the myths and misconceptions about bourbon and provide accurate information about bourbon, its producers, and bottlings. The audience for this book includes everyone either curious about bourbon or who already enjoys it and consider themselves fairly knowledgeable about the subject. There is lots of info in this book and you might find yourself turning to it often as a reference too, especially when you want to know about the specifics behind a bourbon you are drinking. The book is broken down into three sections and Part 1 is History, Legends & Contemporary Truths. This part is divided into an Introduction and a chapter Bourbon Politics. The Introduction provides the basics of bourbon, helping to correct some misconceptions people possess, from the aging requirements of bourbon to where bourbon may be produced. It is a good introduction to bourbon, providing a nice foundation of knowledge. "The labels, stories, and even books about bourbon are greatly influenced by the publicists and marketers who represent the brands." In Bourbon Politics, Fred delves into the myths and legends that have been perpetuated about bourbon, often by marketers who believe that a good story will sell alcohol, but who also know that the story doesn't have to be true. Fred breaks down these myths, providing plenty of history, noting the difference between facts and fiction. He also does not fear to tread down the darker halls of bourbon history, including its roles with whiskey traders & Native Americans and its connection to slavery and cockfighting. This is a fascinating chapter where you will likely learn plenty about bourbon's true history. It also strikes at the heart of all alcohol, from wine to beer, rum to tequila. Marketers and publicists for all of these beverages often promote stories which may not be actually true. They understand the romance and appeal of a good story, which is intended to draw in consumers. For example, in the Champagne industry, there is the story of Dom Perignon, the alleged inventor of Champagne, who allegedly said, "Come quickly, I am drinking the stars." Yet he never said that sentence and much of his life is enveloped in other myths. However, it makes for a good story so continues to be perpetuated. Within this chapter, Fred states: "Unlike wine, for which grape percentages are disclosed and terroir implied through the industry’s Area of Control designations, bourbon uses its label space for backstories and falsehoods." He then continues, "What you don’t see are mashbills, char levels, grain origins, true water sources, distillation techniques, entry proof into the barrel, or other production information." Just take a look at the label on a bottle of bourbon and you will see that little information, if any, is provided on the ingredients and production methods. Even checking producer websites might not garner much of that information. In Part 2, Sources Of Flavor, there are two chapters, including Pre-fermentation and Yeast, Distillation & Wood. This part gets more geeky, into some of the science behind the ingredients and production of bourbon. The tole of corn is examined with a lengthy section of the role of GMO corn. Fred includes his own unscientific tasting test comparing bourbons made from non-GMO corn and GMO corn. He concluded that non-GMO corn bourbon tends to be more complex and taste better. However, with 90% of US corn being GMO, non-GMO bourbon is getting rarer. Though corn is the dominant ingredient in bourbon, Fred states: "But, in the end, corn matters a lot less than the secondary grains— rye or wheat— which distillers frequently call the flavor grains." He then discusses the roles of rye and wheat, which often seems to be overlooked by many when thinking about bourbon. This Part ends with information on the importance of yeast, the role of copper in stills and the effects of barrel aging. Though some of this information is slightly more technical, it too is fascinating, giving you a better understanding of the diverse factors that combine to produce a bottle of bourbon. The final Part, Tasting, is broken down into 6 chapters, including How To Taste and 5 other chapters that divide Bourbon into flavor profiles like Nutmeg-Forward and Caramel-Forward. The How To Taste chapter provides simple suggestions and recommendation on how to taste bourbon, including what to look for and a number of potential aromas/flavors. The five flavor-profile chapters are a reference source you will want to return to again and again. Within each chapter, Fred lists specific bourbons and provides the technical details about them which are lacking on the labels and producer websites. You learn info such as the mashbill, source of the grains, distillation process, barrel aging, filtering method and tasting notes. All of this information will help you find bourbons which fit your tasting preferences, as well as entice you to try other bourbon styles. This is valuable info which you would be hard pressed to find elsewhere in a single resource. In addition, you'll find several bourbon cocktail recipes within these chapters, like the Bourbon Punch. The book ends with an Appendix giving Brand Histories, helping to provide the facts behind the myths and stories that marketers have disseminated. 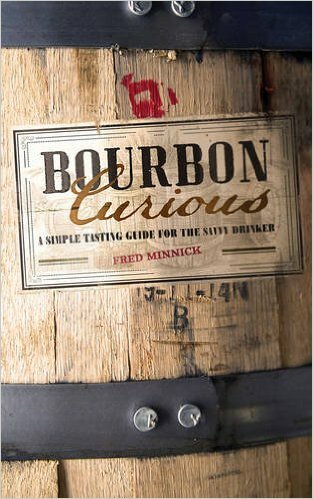 Overall, this is an excellent addition to the small number of bourbon books that are available. It provides far more than just a basic introduction to bourbon, delving much deeper into its history, production and producers. It is very much an insider's book, written by someone who has spent years delving into this special whiskey. Fred has an easy writing style, even when he details some of the geekiest aspects of bourbon. I highly recommend you pick up this book and November is an excellent time to get the e-book at a special low price. It would also make an excellent holiday gift for the bourbon lover on your list. I think I need to pour myself a glass of bourbon right now, maybe some Four Roses. "We are living in perhaps the most exciting time in bourbon history, both from a business perspective and because of the wealth of consumer options." Rant: DON'T DRINK & DRIVE!! !